With the availability of small, air-cooled, ion laser tubes on the surplus markets on lasers are now open to homebuilt laser builders. High currents make the power supply somewhat trickier (and more dangerous) than a simple HeNe laser. Pulsed operation is also possible and the possibility exists to reprocess an old tube as well as use gases other than argon. The first ion laser was the mercury ion laser discovered by W. Earl Bell of Spectra Physics in 1965. This laser, in which the active lasing species in mercury vapour in a buffer of helium, emits at 615nm in the orange, 568nm in the green, and at two IR wavelengths. It was a pulsed laser in which lasing was determined to occur during the afterglow - the time after the main discharge had occurred. This suggested that the mercury ion laser was unlikely to operate in CW mode. While investigating the nature of this laser researchers tried neon and then argon as buffer gases (instead of helium). When argon was used a strange new line at 488nm appeared and would show-up when even a trace of argon was present in the tube. It was noted in an early report that welding grade argon was used as the buffer gas. As well as the discovery of the argon-ion laser oxygen (O+) was also discovered to lase by accident at the same time when four lines in the blue-violet appeared when oxygen was liberated by electrodes used in the tube. The environment inside an ion laser tube was hardly an easy one to tame. High currents required for CW operation led to strong pumping of ions towards the cathode region of the tube. Pressure gradients occurred which led to instabilities in the discharge. A gas return path was incorporated into these tubes to equalize pressures to solve this. Another problem was sputtering which occurs as the tube runs. This effect buries argon atoms lowering tube pressure. A large buffer volume (for small tubes) or an active gas refill system (for large tubes) was required to add gas to the tube and raise the pressure. Modern ion lasers have a fill system like this which monitors tube voltage and inject gas from a high pressure chamber when it drops (which indicates a pressure drop) via a solenoid valve. Ion tubes also run incredibly HOT. A large argon laser might have a tube voltage of 260 VDC and a current of 40A. That means over 10,000 Watts of HEAT must be dissipated in a relatively small volume. Glass tubes cannot stand the stress of this kind of heat and so ceramic must be used. The discharge in the tube is usually confined by discs of refractory metals such as tungsten which center the discharge to the actual bore: only about 1mm!. Argon lasers come in two sizes: small and huge! The small variety are air cooled and resemble an overgrown HeNe tube although their electrical characteristics are radically different. The huge size are water-cooled behemoths which output many watts of power and generally run from 3-phase power sources like the Coherent Innova-90 below which boasts a power output of seven watts on several lines in the blue to violet region. The largest commercial argons run from 480 Volt/3-phase power, consume 6.5 gallons per minute of cooling water, and output up to 25 watts. Although the concepts of running each of these lasers is the same the scale is such that powering a large-frame ion laser is difficult for most amateurs. As well large-frame ion lasers are not readily available on the surplus market (and when they are, the price is out of reach for a hobbyist). Small ion tubes, on the other hand, have entered the surplus market recently in the $100 USD range. These tubes can be powered from a reasonably simple supply running from 110 VAC current (in North America, at least). If you are lucky enough to obtain a large ion laser, this design can be scaled upwards (large tubes need 200 Volts DC plus at 20 to 50 Amps ... that makes the power supply a LOT larger). WARNING: Construction and operation of any laser device is hazardous. Do not attempt to construct or operate a laser without adequate safeguards and safety practices. 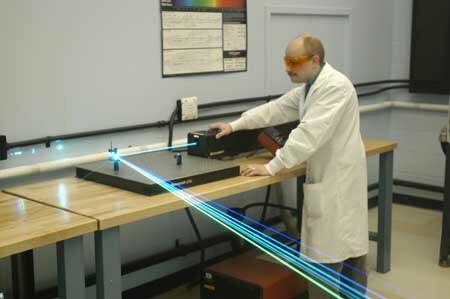 Argon Lasers involve high voltages, high powers, laser radiation and other hazards. The author specifically disclaims any and all liabilities associated with the construction and use of such devices. The design is presented here in the interests of providing information on operational principles only. Having said that, please wear safety glasses when testing high-power supplies such as these and have a fire extinguisher handy. Unlike HeNe supplies failures here tend to be catastophic and smoke and fire usually ensue! If you do not have experience at working with high-power electronics, this isn't a good place to start! A small Cyonics argon-ion tube operating from CW power supply of the type described below. Small air-cooled ion laser tubes resemble an overgrown HeNe tube. They are made of ceramic to take the intense heat generated by the discharge (something you never had to worry about with a HeNe tube) and have a large number of cooling fins surrounding the tube. A large volume of air (over 300 cfm) is blown past the tube - failure of this air flow will result in rapid tube failure!. For most tubes ait is supplied by a small squirrel-cage type blower. Unlike the HeNe laser ion lasers have hot cathodes (the tube itself resembles an old vacuum-tube diode). The cathode is heated by a 2.5 volt, 10 Amp AC transformer. The filament/cathode also serves as the negative terminal of the tube. To keep the cathode from eroding an AC source is required and the filament transformer must be center-tapped. Ion laser tubes run at low voltages compared to a HeNe laser. In the case of a small tube as outlined on this page between 100 and 120 volts DC appears across the tube when lit. Current through the arc is quite high though at 8 to 10 Amps (yes amps, not milliamps). Most lasers of this type (as well as larger water-cooled types) use the AC line directly, rectified and filtered, as the main power source. This means that all parts of the tube are electrically LIVE - nothing is referenced to ground! You can see why this isn't a good first-project. On the other hand, a much smaller (and safer) pulsed supply may be used to power-up ion laser tubes. The power supply itself is simple. First the AC line at 110 volts is rectified by a large (25A, 400V) bridge rectifier. This is then smoothed by a pi-LC type filter. 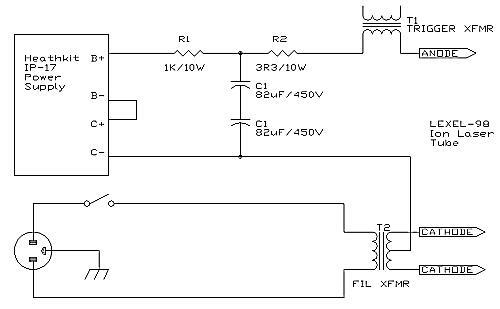 This type of filter, popular in the days of vacuum tubes, has a good ability to eliminate AC ripple since the inductor is a reactive element - it works better, I think, than most designs which use an RC filter network. This filtered DC is then presented across the tube and the current through it is restricted by a LARGE (5 ohm, 225 Watt) adjustable ceramic power resistor. This is fine for a testing supply however an active current regulator is planned as an improvement. Regulating current will do well to elongate tube life as well! The first problem to be dealt with is ignition. Argon tubes will not ignite at 100 volts - over 10 kV is required to ionize the gas in the tube and start the arc. In most lasers this is done by a circuit which boosts the line to between 600 and 800 volts and then a capacitor discharge circuit blasts this through a series transformer which results in a huge high-voltage pulse being presented to the tube anode. Although this works, and might well be the simplest method, it also results in cumulative damage to the laser cathode. The start pulse can have significant energy which may well result in destruction of a small-piece of cathode each time it is started. The method I chose is used in some arc lamp supplies as well as 'arc-start' for many DC welders. It impresses a low-current high-frequency high-voltage on the anode to ionize the tube. In its simplest form, the ignitor resembles a Tesla coil (which, no doubt, many laser enthusiasts are familiar). A high-voltage (AC) transformer at about 4kV charges a capacitor which then discharges at high frequency through a spark gap to a resonant coil. The secondary of the coil then show a very high voltage but at a high frequency and low current - just the thing to ignite the arc safely! My ignitor consists of a 4kV transformer, a 0.05μF/5kV capacitor, a 3mm spark gap, and a trigger coil scavenged from an old arc lamp supply. The secondary of the coil must withastand the 10A or so which power the tube and must have high dielectric value as the voltages produced are quite high. It is possible to wind such a transformer by oneself in a manner similar to making a small Tesla coil. Be sure the secondary is wound with at least #16 gauge wire. The ignitor works quite well and needs to be activates for only a fraction of a second to start the tube. One must be careful to prevent any high-frequency component from the start circuit from entering the rest of the power supply. The electrolytic alone may not be enough as they tend to have large internal inductances (as evident from the fact they do not work for dye lasers). To ensure all was safe a small (5μF, 370 VAC) capacitor is used as a bypass cap across the DC output of the main supply. These AC capacitors are paper/oil types and have low inductances. They will easily bypass any high frequency components which might otherwise wreak havoc in the supply. Finally, it is worth mentioning that a bleeder resistor should be placed across all capacitors capable of storing a lethal charge. These resistors are visible across the large electrolytic capacitors in the photo of the original power supply. Some commercial supplies go one step further in adding a "dump" resistor whereby upon deenergizing the supply (either by selection or by tripping an interlock) the relay shunts a low-value resistor across the capacitor. In this first test a Cyonics/Uniphase tube was used. These tubes are prepackaged in a cylindrical housing. Air is taken from the rear of the housing via a blower using white plastic tubing used for electric clothes dryers. This particular tube outputs about 30mW at 488nm (in the blue). Other tubes are available on the surplus market with a variety of lines (some are multiline producing over 7 lines simultaneously), powers (up to 250mW) and gases (rare, but small krypton-ion laser tubes do appear on the market). I am fortunate enough to be have a mixed-gas argon-krypton tube which has been powered from this same supply. This particular laser, however, has a high tube pressure (probably from years of non-use) and so exhibits only a single dominant 488nm argon blue line, not all of the krypton lines as hoped. It is slated for repumping on a turbomolecular-based gas processing system utilized for a vacuum technology and thin-film course I teach (see the Helium-Neon page on this site for details of the system). Several items must be improved and/or added before the power supply is ready for 'prime time' including the addition of a fail-safe interlock system and a true current regulator. In the case of interlocks they ARE required for safety of the operator as well as protection of the (expensive) tube. ALL ion tubes are equipped with a thermal sensor which opens when tube temp is exceeded. Never knowing _precisely_ if the air flow is high enough (and what happens if the blower intake is accidently blocked?) it is mandatory to shutdown the tube if this sensor is activated. As well, covers on the tube and power supply must be interlocked to prevent one careless mistake from becoming one's last! Finally an external interlock is mandated by Class-IIIb regulations and must be added to the chain. Current regulation is important to prolong the life of the tube, and even during normal operation to prevent "runaway" in which current can climb without limits eventually destroying the tube. Many 'simple' argon supplies do not use a true regulator but rather a simple pass bank allowing adjustment of tube current. Conmmercial supplies feature a full control loop with current and light feedback to truly regulate the tube's current. A simple linear pass-bank can be built using an array of six paralleled 2N3055 NPN power transistors on a large fan-cooled heatsink. 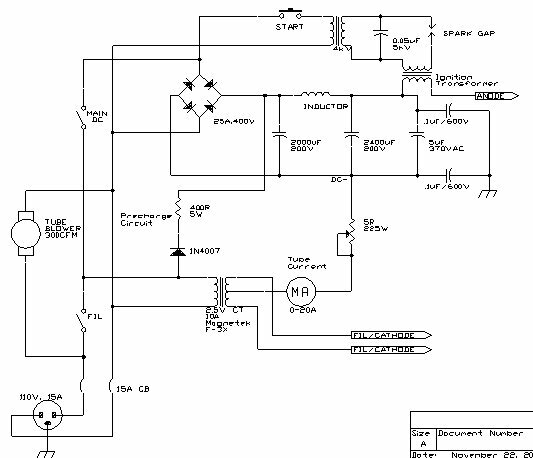 For more info on various power supply designs see Sam's Laser FAQ (on the LINKS page). Surplus suppliers of tubes can also be found on the LINKS page. Be patient as, like all surplus equipment, availability of tubes comes and goes). 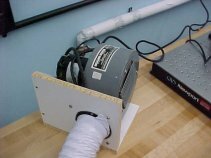 It was desired to construct a grounded-cathode pulsed power supply for use when testing and reprocessing tubes in the lab. Conventional CW supplies, including the one above, have the cathode 'floating' below ground potential. When reprocessing a tube such as an ALC 60X tube, a copper stem is welded to the existing pump-out tube on the cathode making the cathode ground. As well, at the high continuous currents available from a CW supply, faults, including those caused by large pressure variations, can be catastrophic whereas a pulsed supply has a much more limited capacity for destruction!. 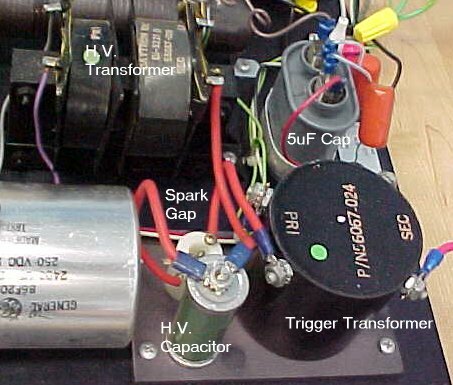 The first attempt was to use a high-voltage supply similar to the design presented in the Amateur Scientist design  except with a heated cathode (This design was also suggested in SAM's laser FAQ). High voltages of up to 10kV were used to charge capacitors of 0.1μF to 0.35μF which then discharged through the tube when the breakdown voltage was reached. Current was measured by inserting a 1Ω shunt between the center-tap of the filament transformer and ground (negative). Peak currents of over 35A were recorded which should essentially guarantee lasing action (threshold current for most tubes is around 4A) however no lasing output was detected at all! A typical current pulse (0.1μF capacitor, 200Ω series resistance), measured via the shunt, featured a pulse width (where current was > 10A) of 183nS, a rise-time of 55nS, fall time of 450nS, and a peak curent of 17.4 A. Still, no lasing output was detected. When "known-good" commercial tubes (e.g. a 60X) failed to lase, a special tube was used with a valve allowing repumping (see below). The tube was evacuated to better than 1*10-6 torr and refilled with UHP argon gas over the pressure range from 10mTorr to 280mTorr but again, lasing was not detected (despite the fact that at a pressure of 150mTorr peak current was measured to exceed 40A). Relaxation oscillators employing high voltage and low capacitances do not appear to be the correct approach. It is known that even an overpressured tube will blink intermittently during starting using a commercial supply (as the capacitors in the supply discharge into the tube) and a pulsed supply was designed along these lines. The supply, seen in the diagram below, charges a main capacitor from a variable power supply to about 200V. This is insufficient to ignite the tube, though, so a series trigger transformer is used to supply a high-voltage pulse to the anode to start the discharge in a manner similar to that employed with the CW supply. When the pushbutton is pressed, the tube fires and current flows from the capacitor as a relatively long (quasi-CW, >1ms) pulse of current. No attempt was made to reduce inductances within the discharge path since the laser is known to operate in CW mode regardless and so discharge time is unimportant. With 200V of DC on the main capacitor, and the trigger tranformer capable of supplying a 3mm spark in free-air, the system works reliably giving a pulse of laser output each time the button is pressed (so long as time is allowed between firings for the capacitor to charge). It was curious to note that there is a minimum capacitance at which the laser will operate. 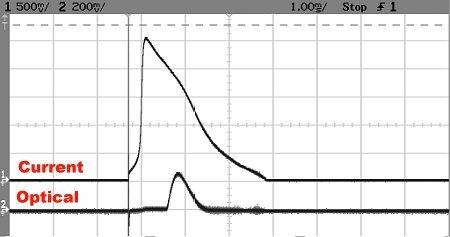 Using a 10μF capacitor lasing was not observed even when the operating voltage was increased to 400V! Current monitoring (via a shunt on the center-tap of the transformer again) revealed currents of over 20A peak. When a larger capacitor was employed (47μF was found to be the minimum for lasing), the current pulse was not appreciably larger (in many cases smaller) however the pulse was, as expected, wider! Apparently, the success or failure of lasing depends on the width of the pulse and not necessarily the peak current. Capacitances (all electrolytic) of 47μF, 82μF, and 510μF were used with progressively larger output pulses. In the example below, an 82μF capacitor was employed at a voltage of 200V. A current shunt of 0.25Ω was used so that a peak current of 10A is seen here. The development of the light pulse, as measured using a Newport SL-818 power meter, is shown on the lower trace. Clearly, the production of the light pulse does NOT coincide with the current peak, but occurs 500μs later. This same behaviour was seen when the 510μF capacitor was employed which yielded 16A peak currents and much larger optical output however the delay was still seen. I do not believe the delay can be attributed to the power measuring instrument and such delays have been previously observed  although never to this extent (although one must realize that the pressure in the tube is much larger than one designed solely for pulsed operation). It was important, as well, to heat the cathode properly. Cyonics/Uniphase tubes require less filament current so that the measured voltage across the filament at the tube connections was 2.0V. With an Omnichrome-532 tube, the same filament transformer yielded only 1.5V and was clearly being overloaded (it was overheating). An inadequately heated cathode such as this results in unreliable firing of the tube (especially when warm) and will ultimately result in cathode failure. 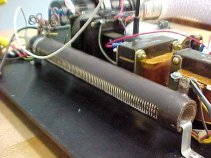 A new 3V 50A filament transformer (Hammond 165Z3) was then used with these tubes. This supply has been useful for testing reprocessed tubes during the gas fill process since it allows a grounded-cathode configuration (see below). While it is not suggested that the casual amateur refill an ion laser tube, tubes can be evacuated and reprocessed using a high-vacuum system and even used with gases other than argon. The tube below, an ALC-60X, was carefully opened in a class-1000 cleanroom and the original filling stem silver-soldered onto a 1/4" copper tube. A Swagelok/Nupro SS-4BK high-vacuum valve is used to isolate the tube from the vacuum system. This arrangement allows for the reprocessing of the tube with argon as well as other gases (e.g. krypton and oxygen). It is also possible to employ the tube in fast-discharge experiments such as that used with the neon laser. With that particular laser, a HeNe tube was filled with pure neon gas and pulsed with a fast-rising current. After several minutes of use, however, the internal mirrors on the tube were visibly damaged by the high-energy plasma. Use of a tube such as this is preferable since it lacks internal mirrors with their easily-damaged coatings instead featuring quartz windows at Brewster's angle. When the filling stem is connected to a vacuum system, electrically, the cathode is now at ground potential and so a commercial CW supply cannot be used. It is intended that either an isolated supply (with the negative terminal at ground potential) or a pulsed supply, such as that described above, be used with the system. Some unusual tubes (e.g. an ILT) have the filling stem from the anode so a grounded-anode (positive ground) power supply system must be used since the anode would be connected to the grounded vacuum system. During initial experiments (using the tube as a relaxation oscillator with high voltages and los capacitances), high voltage arcing was found to plague the system jumping from the anode to the cooling fins and then the cathode. In an attempt to halt this problem the cooling fins were removed from the tube. Unfortunately, 60X tubes feature only two narrow non-conducting areas between the tube and a metal sleeve, seen here (in retrospect, an Omni-532 tube would have been a better choice). Regardless, the bare ceramic was cleaned and silicon sealant used as additional insulation to prevent external arc-overs. The tube would not lase regardless of the pressure and despite the fact that current pulses were verified to be over 40A. The tube was then used with a pulsed supply identical to that described on this page using a 510μF capacitor and 3.3Ω series resistance. Using the maximum available voltage of 400 volts, discharges were reliably obtained over a wide range of pressures. 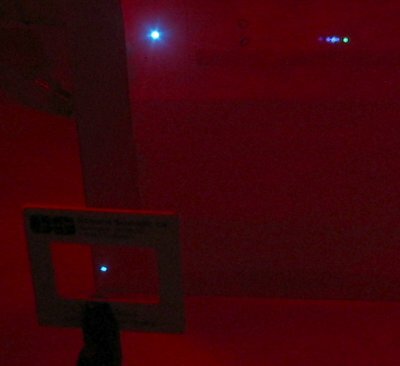 Lasing at 488nm ('blue' optics were installed on the laser which do not support the green line) was observed over a pressure range of 600mTorr to 350 mTorr of pure (UHP grade) argon gas. Of course, without cooling fins the tube is now useful only using a pulsed supply - a CW supply would result in high temperatures which would quickly destroy the tube. As well, a small fan (e.g. computer type) is still required to cool the heated cathode. A larger-frame Lexel-98 tube was repumped as an experiment in E/P ratio for the Vacuum and Thin-film technology course in which students experiment with various pressure ranges to determine the optimal E/p ratio. 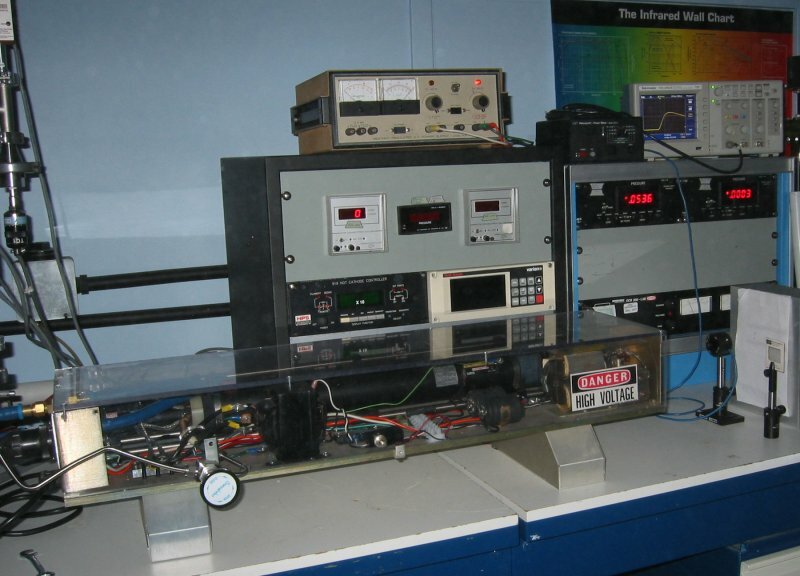 The Lexel-98 is a small water-cooled laser rated at about 2W CW output, and this particular tube had a cut gas line which connected the tube to a large ballast volume beside the tube in the head. 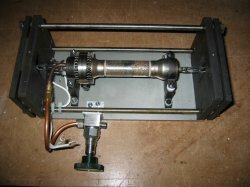 A short length of stainless tubing was attached to the tube using Torr-Seal epoxy (which has low vapour pressure) and was connected to a vacuum system employing a turbomolecular pump. 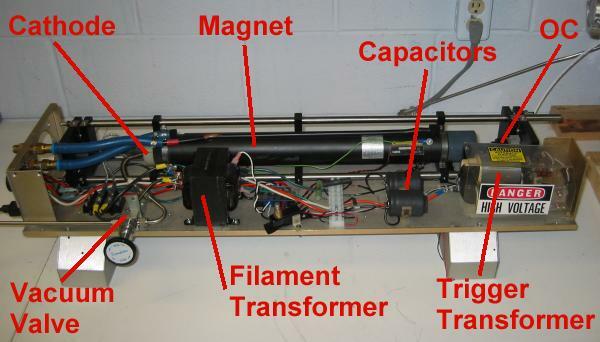 The complete laser showing all major components. The vacuum line on the left side connects the tube to a vacuum system. The complete experimental setup showing the Lexel laser as well as various vacuum gauges for the vacuum system in the background. On top of the 19-inch rack sits the power supply and, to the right, an oscilloscope to capture the amplitude and shape of the laser pulse. The tube was opened to atmosphere during connection of the gas valve and during the first pumpdown it was observed to liberate a huge amount of gas when heated - enough to raise the pressure from zero to over 200mTorr in a closed system. The cathode was subsequently outgassed by heating it with the pump running "full open" until the pressure was not seen to rise again when the system was sealed from the pump - this 'bake-out' procedure took a day to accomplish! After that, the tube could be filled with the required 50mTorr of argon gas, sealed, and would operate reliably. The tube was powered using a testing supply as outlined above. 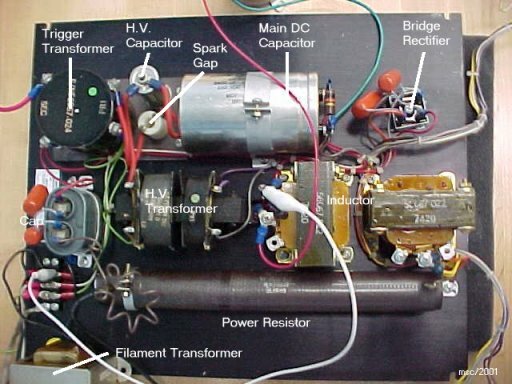 A 3VAC/25A filament transformer (scavenged from an old Coherent CR-6 laser head) powers the heated cathode. The main capacitor bank consists of two capacitors in series to handle the voltages used. A dual power supply, a Heathkit IP-17 used originally to power vacuum tube circuits, was used. The two outputs, "B+" variable from 0 to 400V and "C-" variable from 0 to 150V, are used in series to charge the capacitors (which can then be charged to a potential of 550V). By using a split supply the "B+" supply alone is used to charge the trigger supply (two 1μF/400V capacitors in parallel, as scavenged from the original Lexel-98 power supply) preventing that system from being charged to more than 400V. In addition to the anode supply, a separate regulated supply is used to power the magnet which consumes 1A at about 80V. A simple cooling system consisting of a garden-pond pump and a five-gallon pail of water is used to flow water through the magnet and cathode. After careful alignment of the optics, and repeated flushing to eliminate impurities emanating from the cathode, the tube was found to lase reliably at pressures between 40mTorr to 70mTorr (with an anode voltage of 500V) as predicted by theory (With a tube length of 50cm and an anode voltage of 500V, argon, with an E/P of around 200 V/cm-torr, should operate around 50mTorr). The magnet was also found to be essential for reliable output as well. The output of the Lexel laser is seen here split by a diffraction grating. The bright 514nm emission is seen to the far right as well as the 488nm emission in the middle of the spectrum. A pulsed argon laser is constructed. 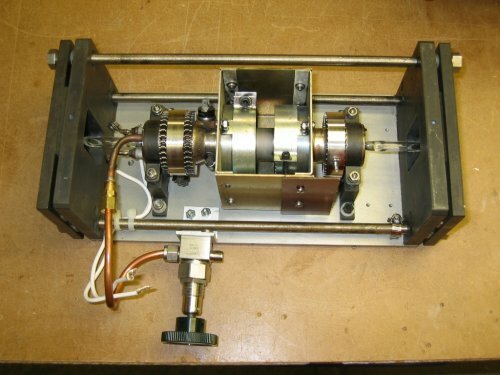 A pulsed experimental laser. Details the use of Argon, Krypton, Xenon, and Oxygen. Outlines laser oscillation obaserved in ionized neon, argon, krypton, xenon, and oxygen. Also discussed quantum mechanics and quantum excitation mechanisms of these lasers. Diagrams (except those as noted), text, and photographs Copyright � 2004 by M. Csele 2004. Portions are excerpted from Fundamentals of Light Sources and Lasers (ISBN 0-471-47660-9) and are copyright � 2004 by John Wiley & Sons. Reproduction forbidden unless written permission granted by John Wiley & Sons.